Barbican Theatre, London, 7th December 2013 to the 25th January 2014. …a fine study of a dying man bursting with intemperate rage at Richard’s betrayal of his country. 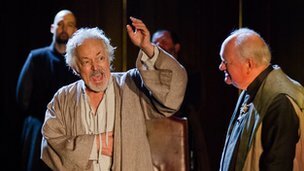 Ferocious eloquence overcomes deathbed infirmity in Michael Pennington’s superb portrayal of John of Gaunt. A fine, restrained Michael Pennington gives desperate dignity to John of Gaunt’s lush … lament for England. Michael Pennington … and Jane Lapotaire … give a masterclass in history-play acting..
At the Opening Night Party for Richard II at Stratford on the 17th October 2013 Greg Doran made Michael his first Honorary Associate Artist. Click here for the article. The DVD/Blu-ray of Richard II will be released on Tuesday 6th May, 2014. The DVD extras include a commentary by Greg Doran, while the Blu-ray has an interview with David Tennant.